Restenosis refers to a gradual re-narrowing of a coronary artery after a blockage has been treated with angioplasty and stenting. If restenosis occurs, it usually happens within 3 - 12 months of the procedure. Because restenosis causes the artery to become narrow again, symptoms of angina commonly return. Restenosis was recognized as a problem in the very earliest days of angioplasty, occurring in as many as 40 - 50% of people who were treated with angioplasty alone. In fact, the reason stents were developed in the first place was to reduce the incidence of restenosis. To a large degree, stents have been successful in doing so. Even with the first generation of bare metal stents (BMS), the incidence of restenosis was substantially reduced (to roughly 20 - 30% in 12 months). Subsequently, drug-eluting stents (DES) were developed to attempt to reduce restenosis even further. In DES, the stents are coated with drugs that inhibit the tissue growth that leads to restenosis. The first generation of DES reduced the incidence of restenosis to about 15% at five years. Newer DES have reduced the rate of restenosis even further, to about 5 - 7% at five years. Angioplasty (and stent placement, since it is always accompanied by angioplasty) is a form of tissue trauma. During angioplasty, a catheter carrying a deflated balloon is passed across an atherosclerotic plaque in a coronary artery, and then the balloon is inflated. The inflation of the balloon compresses the plaque, thus widening the opening of the artery. A stent — a system of tiny struts — is then expanded at the site of the angioplasty, to keep the expanded artery from collapsing back down. Compression (or “smashing,” if you prefer) of the plaque is not a gentle process, and virtually always creates trauma to the blood vessel wall. Restenosis occurs as a result of tissue growth at the site of treatment. It can almost be thought of as a result of a “healing” process following the localized trauma of angioplasty. The endothelial cells that normally line the coronary artery proliferate at the site of the trauma. If this proliferation of endothelial cells becomes excessive, the cells can obstruct the blood vessel at the site of the stent. Restenosis can also occur as a result of recurrent atherosclerosis — the process that caused the coronary artery blockage in the first place. Restenosis caused by atherosclerosis tends to appear a relatively long time after the procedure — a year or more. The more typical restenosis, which is usually seen within 6 months and almost always within 12 months following the procedure, is usually caused by endothelial tissue growth. Restenosis is not the same as the more dreaded stent thrombosis, the sudden occlusion of a stent from the formation of a blood clot. Stent thrombosis is usually a catastrophe, since it often produces sudden and complete blockage of the coronary artery. 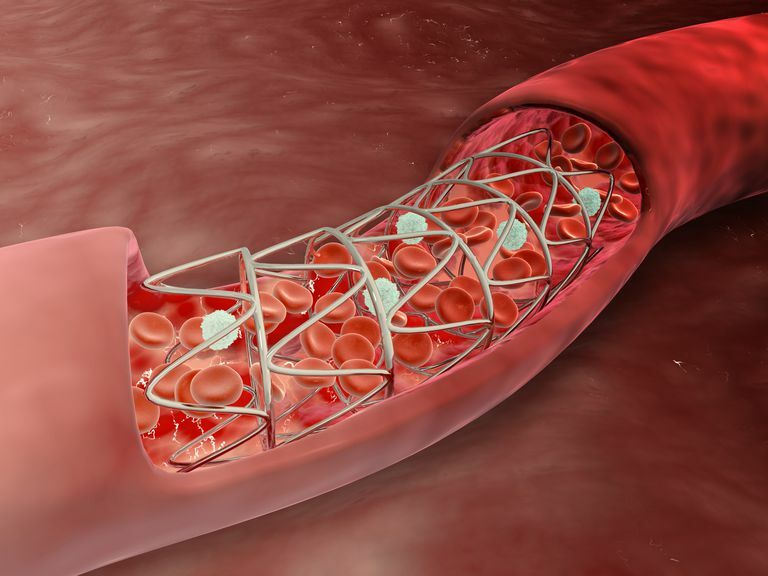 The risk of thrombosis is highest the first few weeks or months after stent placement, but is greatly reduced with the use of platelet-inhibiting drugs. There is also a small but real risk of late stent thrombosis, thrombosis occurring a year or more after the stent was placed, and in recent years it has become apparent that antiplatelet drugs should be continued for at least one year and likely even longer. The best way to prevent late stent thrombosis, however, remains controversial. While the use of DES has greatly reduced the incidence of stent restenosis, it has not eliminated the problem. If restenosis occurs and is producing symptoms of angina, treatment usually involves a repeat procedure, typically, insertion of a second stent in the same location. Medical (noninvasive) therapy for angina is also an alternative. Coronary artery bypass surgery is another option for people with stent restenosis, especially if the restenosis recurs after a second stent. Restenosis was originally the major limitation in using angioplasty and stents for coronary artery disease. As stent technology has improved, restenosis has now been greatly limited as a problem. However, the use of modern stents has introduced another management problem to the care of coronary artery disease, stent thrombosis. The best way to reduce the risk of this new problem is still being worked out. Dangas GD, Claessen BE, Caixeta A, et al. In-stent Restenosis in the Drug-eluting Stent Era. J Am Coll Cardiol 2010; 56:1897. Piccolo R, Stefanini GG, Franzone A, et al. Safety and Efficacy of Resolute Zotarolimus-eluting Stents Compared With Everolimus-eluting Stents: a Meta-analysis. Circ Cardiovasc Interv 2015; 8. Räber L, Wohlwend L, Wigger M, et al. Five-year Clinical and Angiographic Outcomes of a Randomized Comparison of Sirolimus-eluting and Paclitaxel-eluting Stents: Sesults of the Sirolimus-Eluting Versus Paclitaxel-Eluting Stents for Coronary Revascularization LATE trial. Circulation 2011; 123:2819.